the hotel rooms are very basic, but clean. the pool and pool bar area are nice with a chilled out atmosphere. we were not troubled by noise, athough we are all heavy sleepers! the staff were friendly, the breakfasts what you would expect in budget accomodation. all in all, this hotel is not 5 star, but it is not advertised or priced as such.. we had some budget 'fun in the sun' which is what we wanted. Moved after two nights. Would not go back ! The Galfi is a basic hotel, clean and more than adequate for a short stay (5 days). Have given food 4, breakfast is included in the price and available are cereals, toast, range of rolls and bread, ham, cheese, jams, boiled eggs, fresh fruit, cakes, fruit juice, tea and coffee. You help yourself to whatever you want. Snacks and salads are available from the bar if needed, ate a salad and a pizza baguette which were fine. Gave 3 for location, it was fine for us old fogeys but youngsters may want to be nearer the action. However it does mean you get a good nights sleep, apart from a demented cockrel who has messed up his body clock and crows at 2a.m. and other mad times. Staff were generally helpful (apart from 1) and cheerful. The only complaint was that the beds were uncomfortable but we knew what we were booking so it was fine. We were only going to Ibiza to check on daughter who is working in San Antonio this summer and wanted a cheap hotel within walking distance of her apartment and bar so it was more than adequate. This was a family run hotel until this season, but the family has now sold it and I think azure hotels has taken it over so anyone who is expecting the same level of personal/family service may be disappointed. 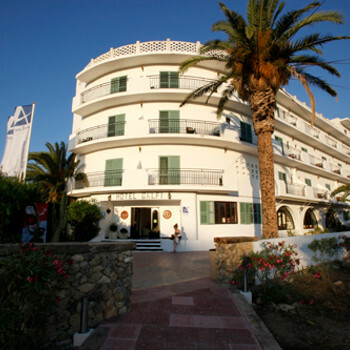 If we wanted to visit our daughter again we would use this hotel again, however I did not really take to Ibiza, but hubby liked it. Set back from the main road and generally very quiet apart from the early morning chorus of a couple of dogs and a brood of chickens across the road. Only about a 10-15 minute walk to the nearest bar, less for the beach. Breakfast is best described as basic continental, cheese slices, ham, salami, bread and two types of cakes, orange and pineapple juice, tea (extremely weak) and coffee. Staff very friendly, especially the guy that works late afternoon into the night. He runs the reception and the bar, somehow at the same time, has a very good command of the English language and an equally good sense of humour. The ground floor area consists of reception, tv lounge, internet area, breakfast room, bar and lounge. For the grade of hotel, we both found the ground floor area impressive. This was also complimented by the gardens, which are adjacent to the small swimming pool. Excellent small and friendly family run hotel-set back from the main area of San Ant. so a good nights sleep is assured! This hotel is ideal for couples as it is adult only and bar etc is shut before midnight so not a good base for party animals. Very secure hotel with 24 hour security balcony doors are alarmed and all corridors have security cameras. The family who own it are extremely friendly and make you feel part of the family-don't expect any frills as the rooms are very basic but adequate and for the price who could complain.